A very busy cab shape to this piece. 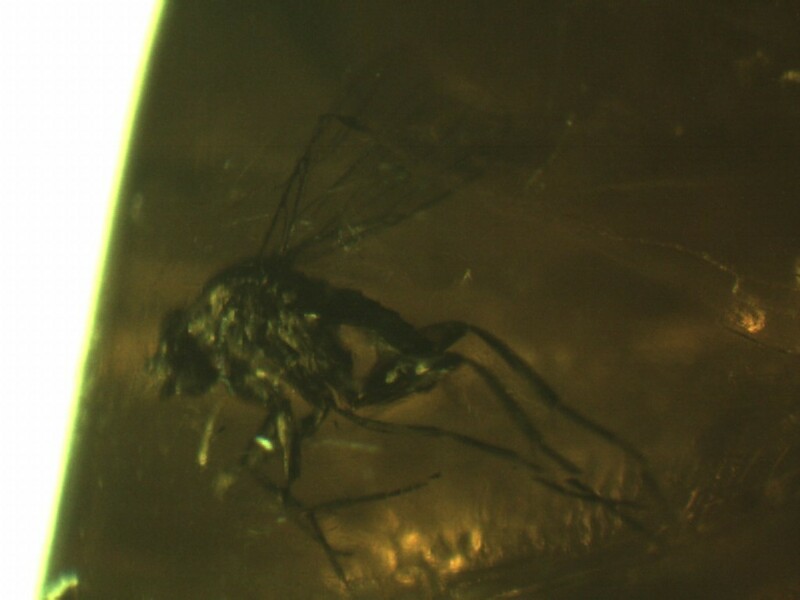 There is a nice fly, Diptera, Brachycera. On the other side is an unusual 'fungal' formation. At least that is what it looks like. There are two spots that appears to have fungal hyphae emanating from a central area. Interesting formation. I almost always know what I put up for sale. This one I am not sure, a wasp? an ant? But that is not the cool bit. Look closely and you will see fungal hyphae all over this animal. Not only that but it appears that there are some fungal fruiting bodies. I have never seen these before. Hazy piece with a multitude of what looks like termite wings and in the middle is a difficult to see cricket. Interesting piece with a good price. 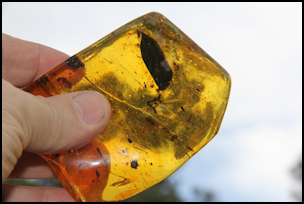 This is one big chunk of amber. It is about 3.5 x 3.5 x .5 inches and weighs 98.2 grams. Inside is a zoo. there is so much inside that I cannot even photograph all of it (and I did photograph as lot.) 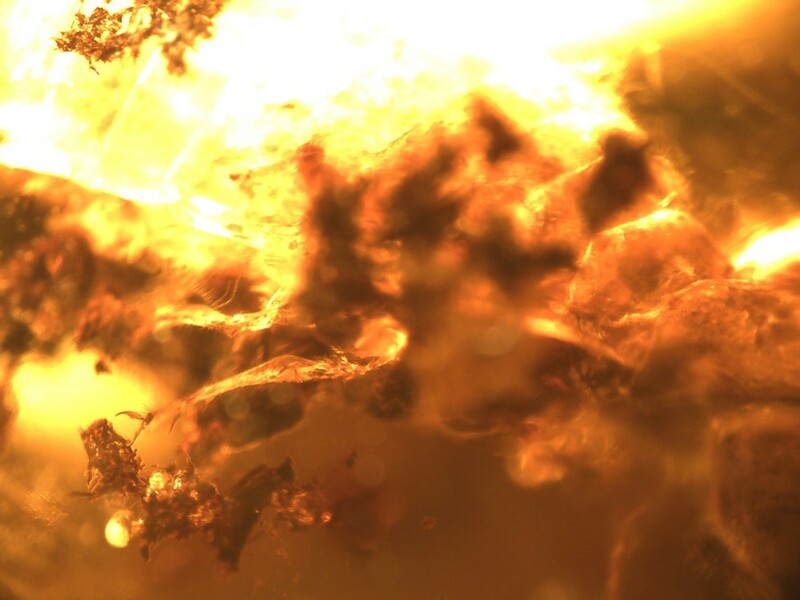 The most obvious thing is an actual leaf from the tree that produced the resin in the first place. In addition to that, there are numerous worker ants, gnats, midges, winged termites, caddisfly, I even saw an adult planthopper. 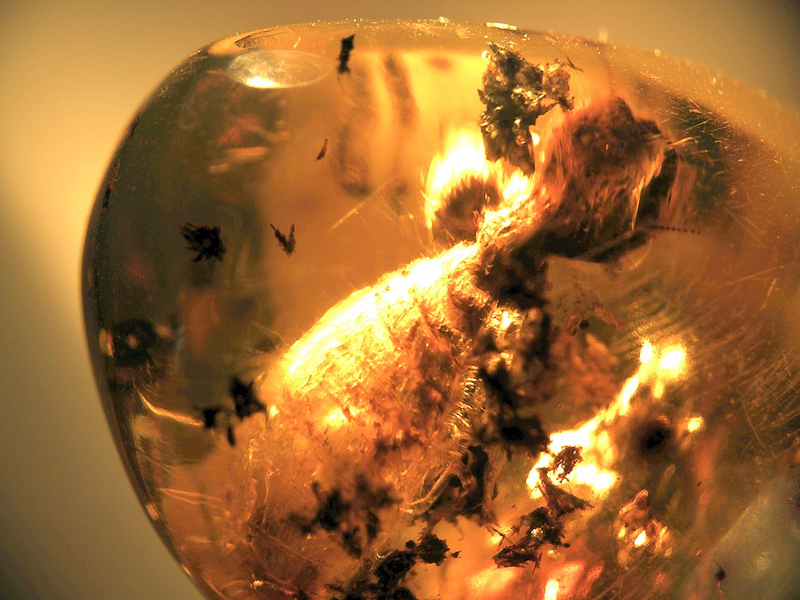 This is a giant piece of clear Dominican amber. A very impressive piece. A rather dark piece with many minute air bubbles and other debris inside. This does have a pseudoscorpion, Chelonethida, Pseudoscorpionidae. 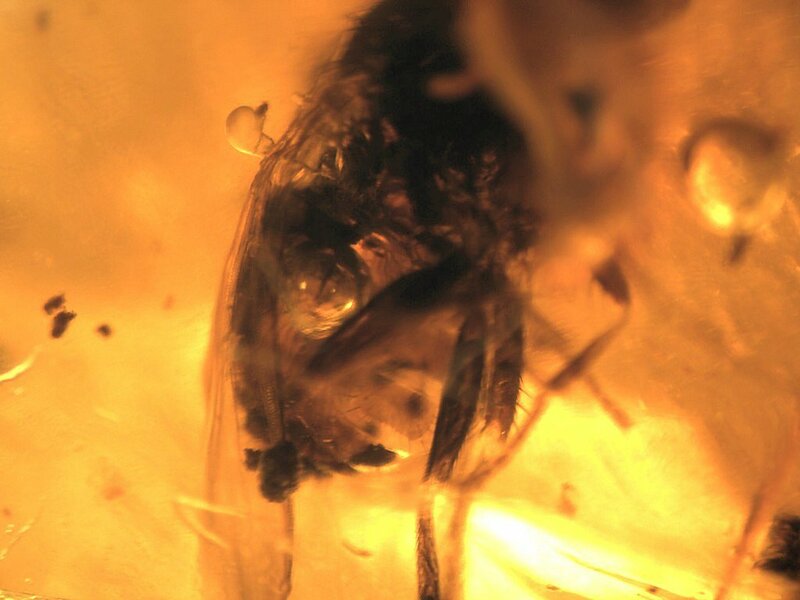 Hymenopteran. Good price on this piece. 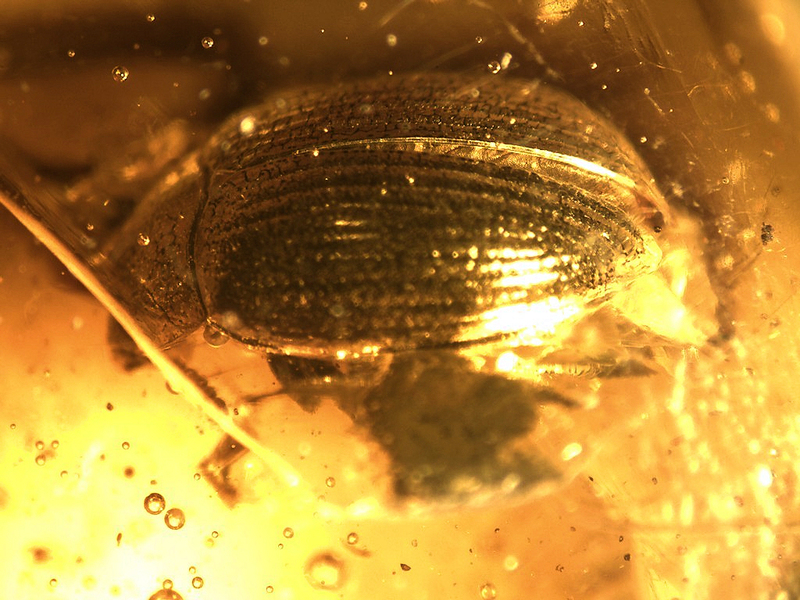 A thin cab that has a beautiful looking leaf beetle, Coleoptera, Chrysomelidae. Real good piece. Just a great example of a female worker Camponotus ant, Hymenoptera, Formicidae. This is a fun one. 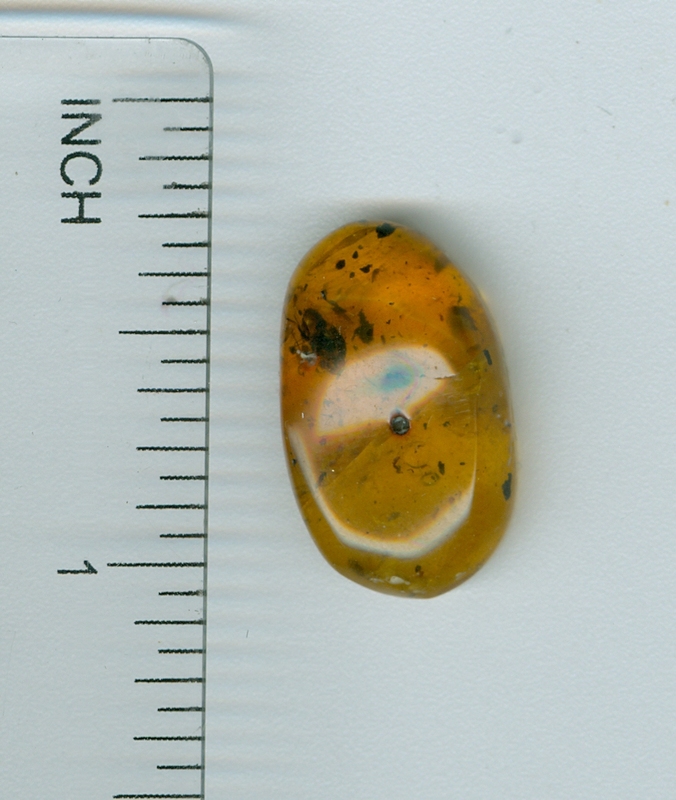 First, it is NOT Dominican, but it is Mexican amber from Chiapas. Second, this is an interesting piece. 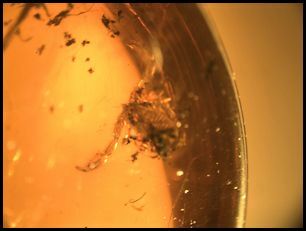 Some debris inside along with a large worker termite, Isoptera. Now the cool bit: it has a large bubble inside. This is often called an en-hydro. 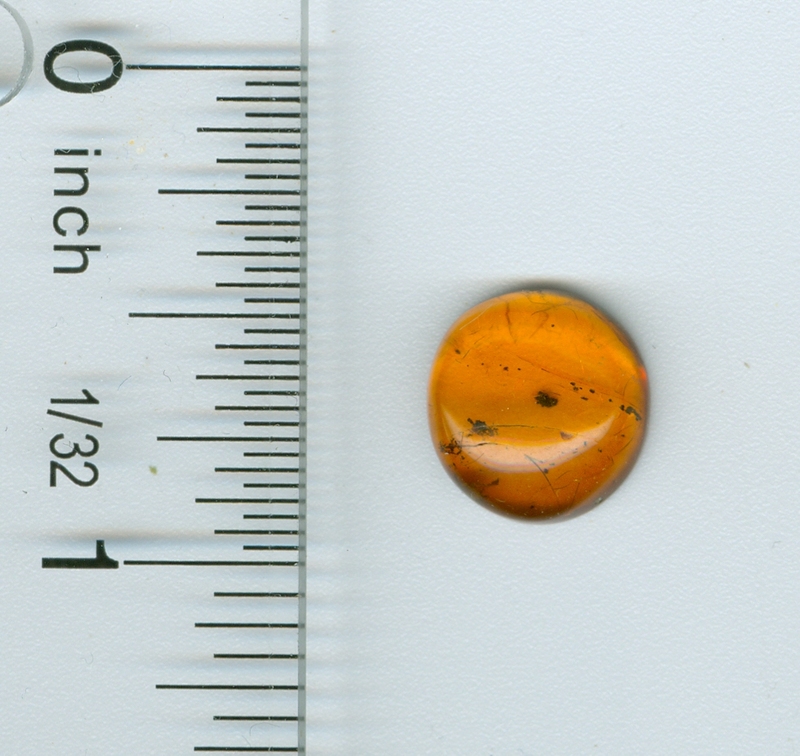 It is a bubble that you can see move when the amber is tipped. 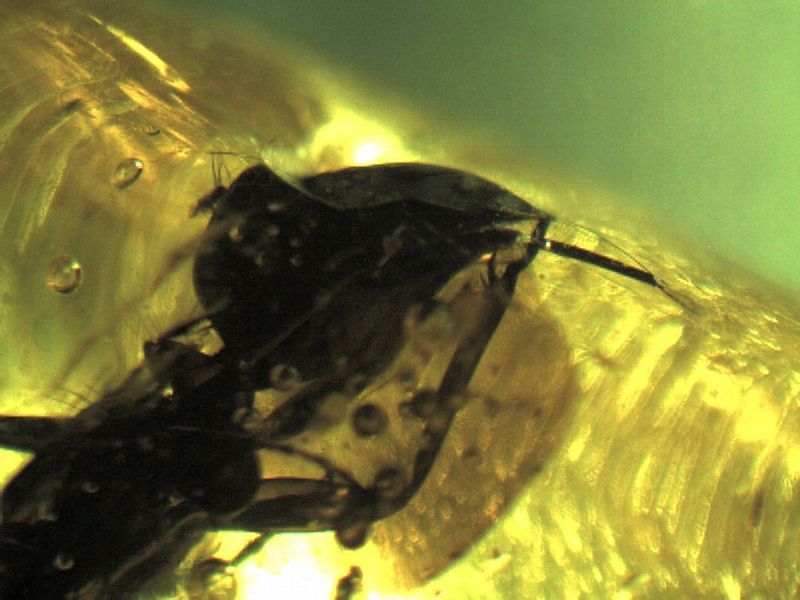 I look at that, know there is water inside the termite's body and wonder. Any bacteria in the water? Any viruses? What would happen if you accidentally broken open the piece and released the water? 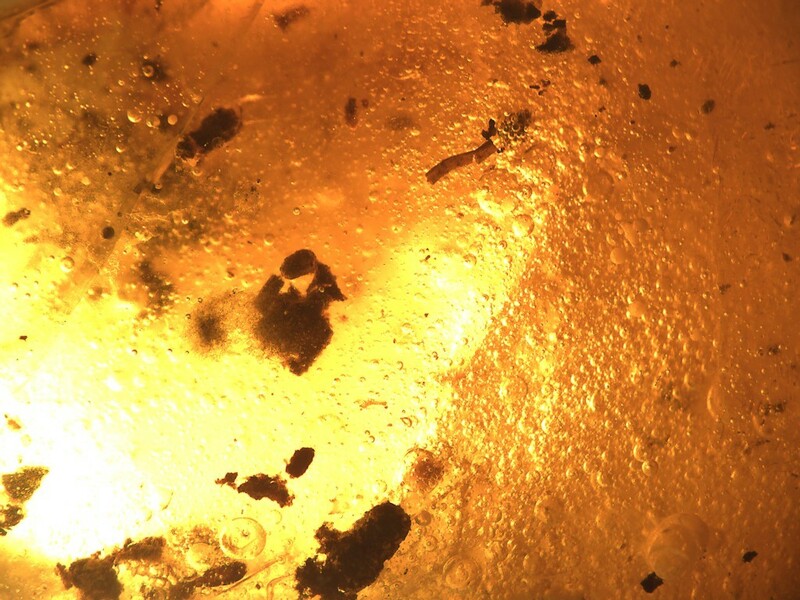 Here is a very recent article about ancient viruses and bacteria. Is there a bug that would wipe out human kind? Just fun stuff to think about. Here is a good one - a video of the bubble moving, take a look. Pseudoscorpions, Chelonethida, are so uncommon in amber that they command a very high price. 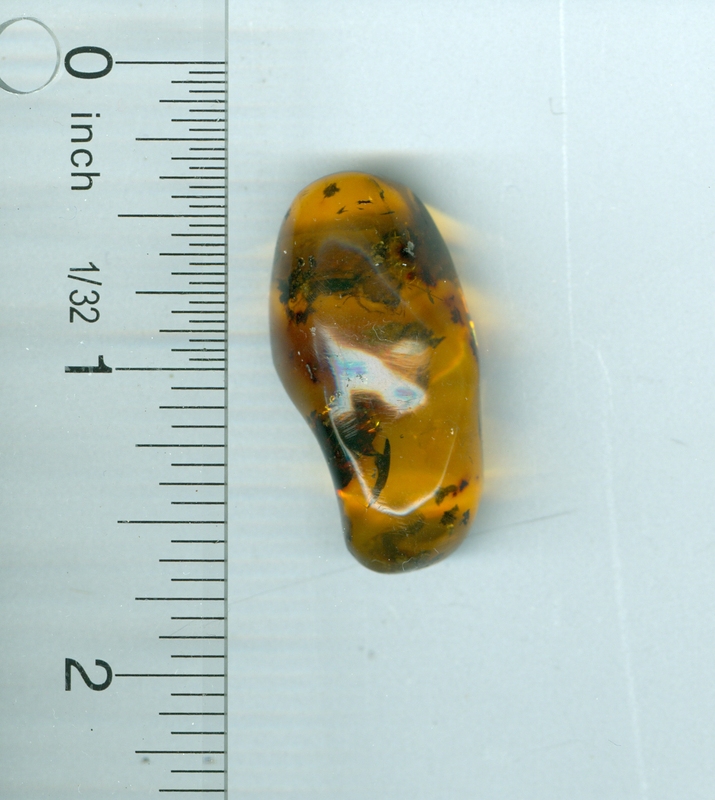 This one is in a small piece of amber with some surface glazing (does not detract). This one I am not sure, but I do know it is large (about .4 inches). Maybe it is a termite without wings. The body is interesting and I am just not sure. My lack of knowledge is your gain on this. Here is a rare one: this is the larvae of an owlfly (similar to an ant lion), Neuroptera, Asclaphidae. They are as rare as hen's teeth. 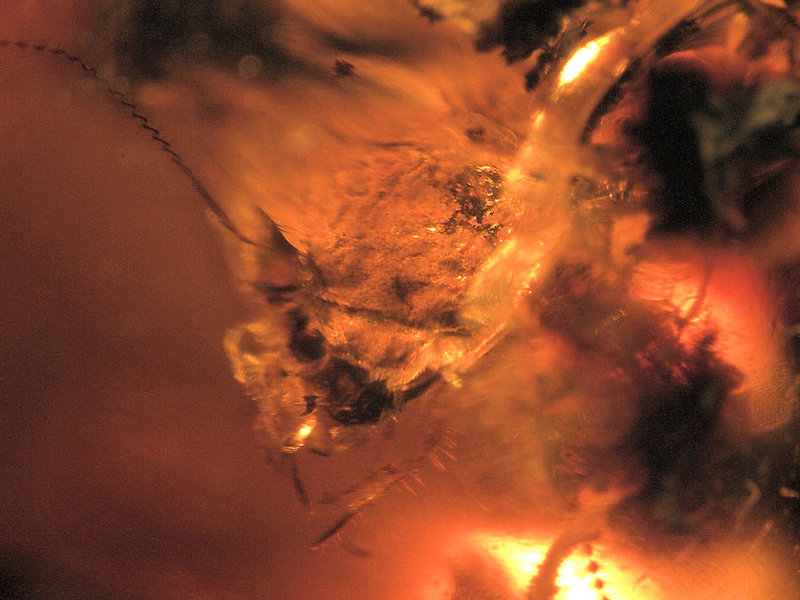 The larvae inject their victims with poison, which serves to paralyze the prey while the owlfly begins feeding. 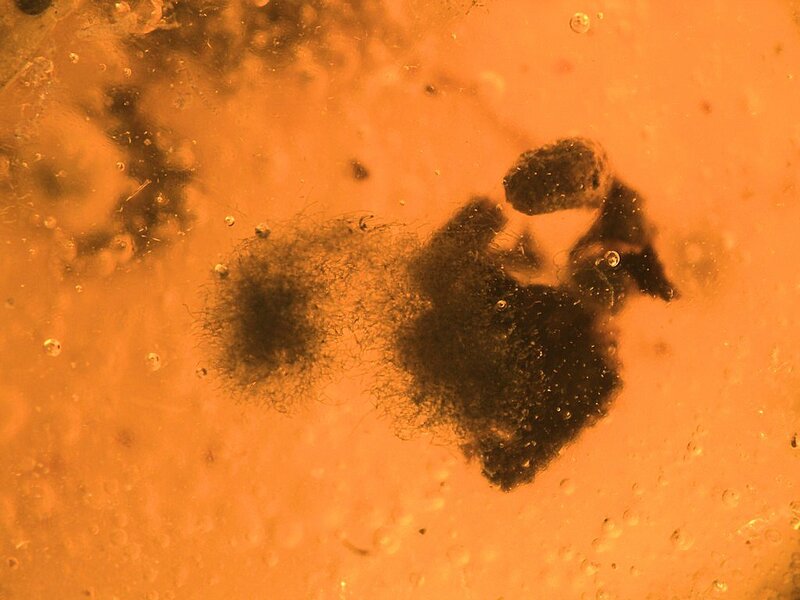 Also in this piece is an ant, and a mite and even what looks like a bunch of insect eggs (I am not sure they are though). 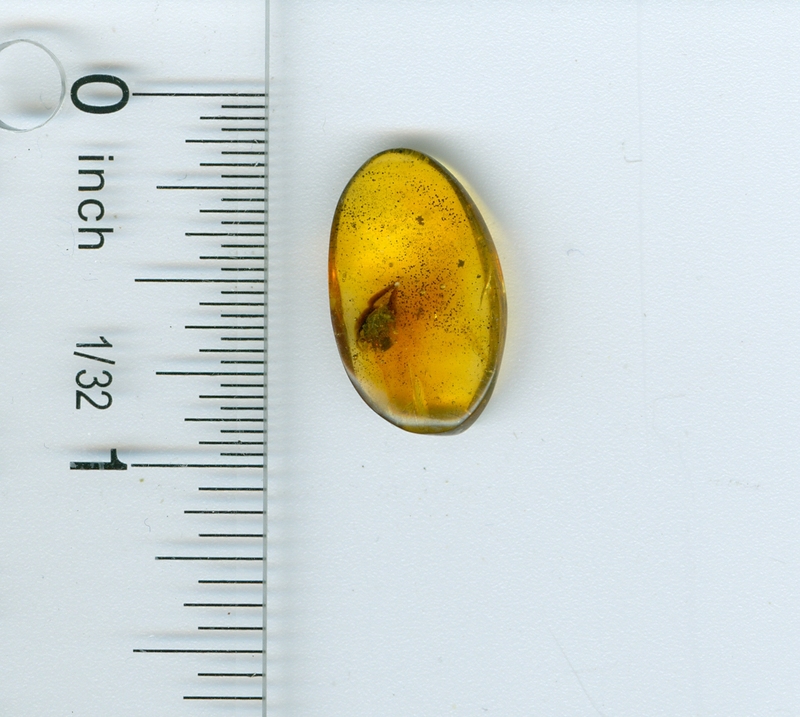 This is a very large piece of Dominican amber, 20.5 grams. 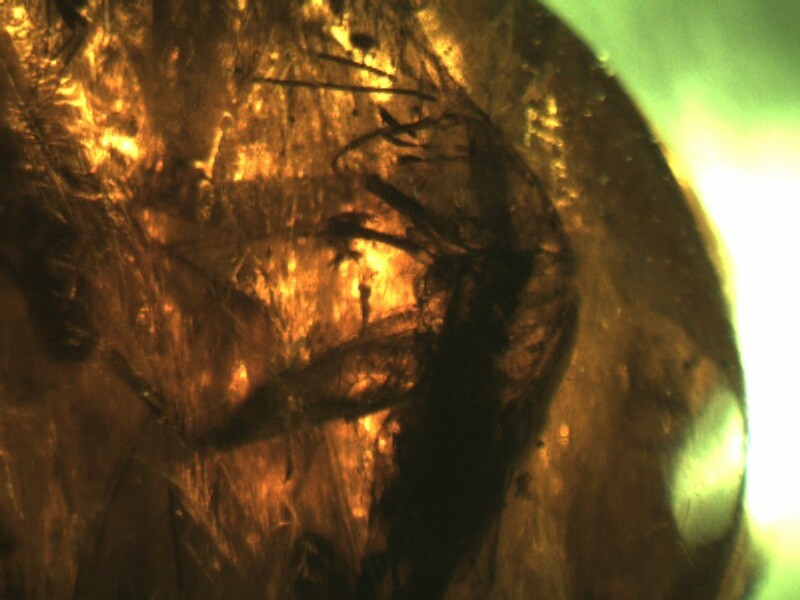 It is very clear with a number of 24 million year old air bubbles. One set of air bubbles are decomposition bubbles emanating from a very large worker termite. Really a cool piece. has a slight surface glaze. 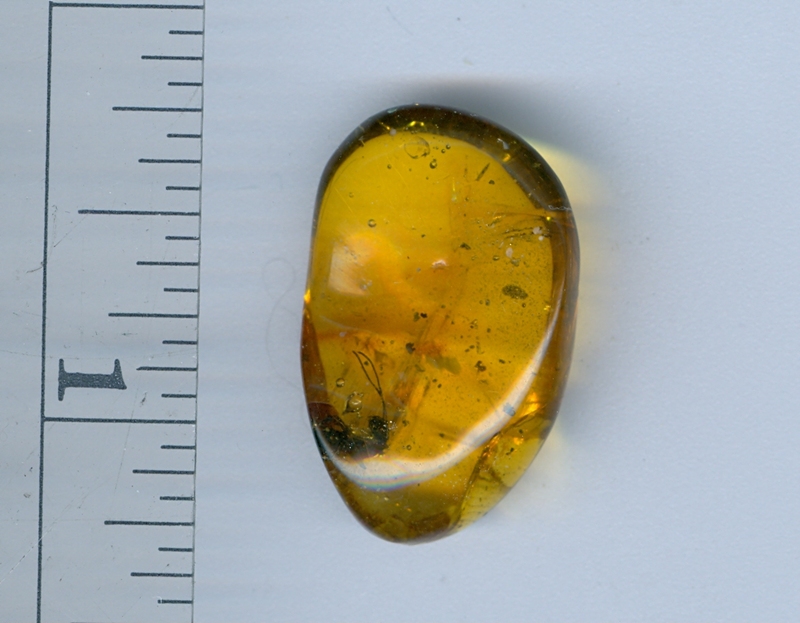 46.5 grams of clear yellow amber. This huge piece has bits and pieces of leaves and also a flower. Great piece to put on your desk for everyone to see. Lots of air bubbles also (that makes it cool). I hate to sound wishy-washy, but I am not sure. This is probably a Coleoptera, Colydidae, a large cylindrical bark beetle. 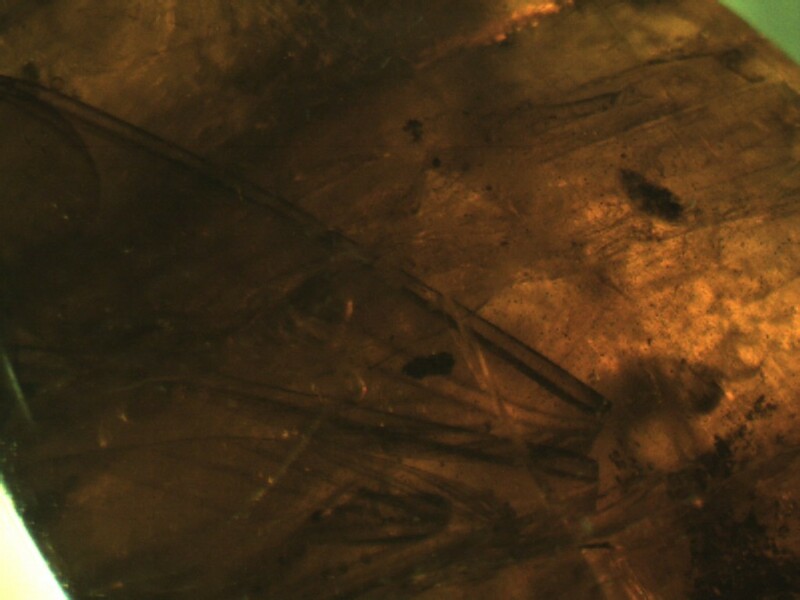 It is difficult to see, but this is a very unique specimen - maybe new! 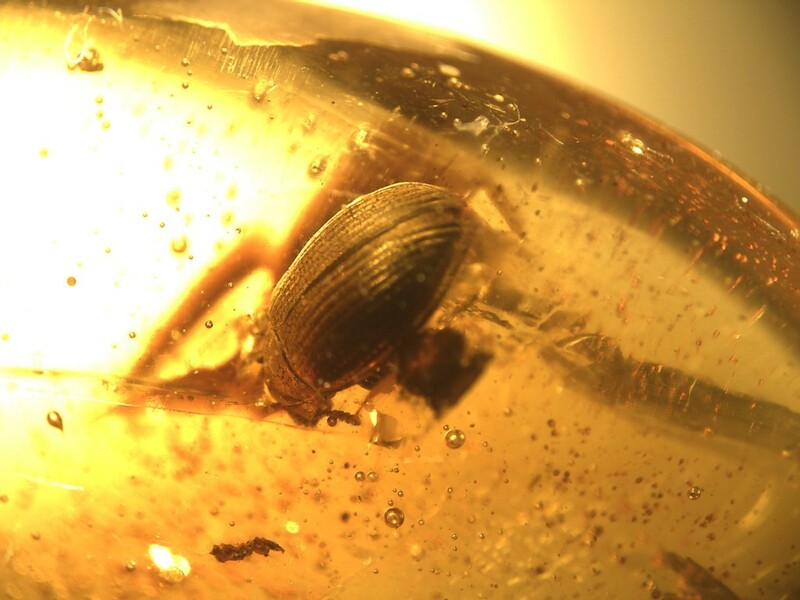 Here is a pill bug, Diplopoda, Glomeridae. This is a family of millipedes. 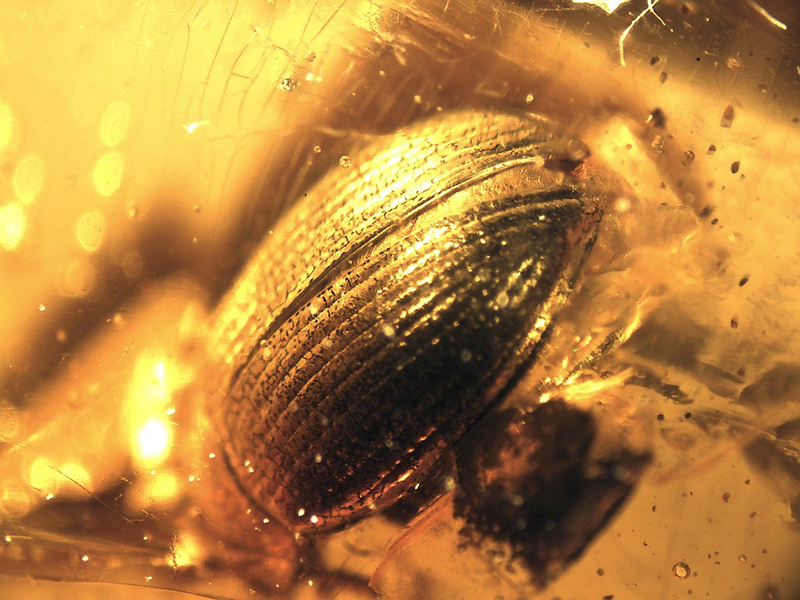 They are not common in amber. This also has a small spider in it. I like this one because it has a daddy-long-legs, Opilione. This is also called a havestman. Also in this piece are tow small springtails, Collembola, 2 ants, Formicidae and part of a plant. Good piece. Coleoptera, Homoptera, super family Fulgoroidea, planthoppers. It looks like the animal died on one layer and then covered in another. Perfection seems to always come as a flower. This is a beautiful piece - clear, wonderful color and an easily seen flower. Just magnificent. You will fall in love with the first image. This is one of those pieces that something new shows up every time you look at it. 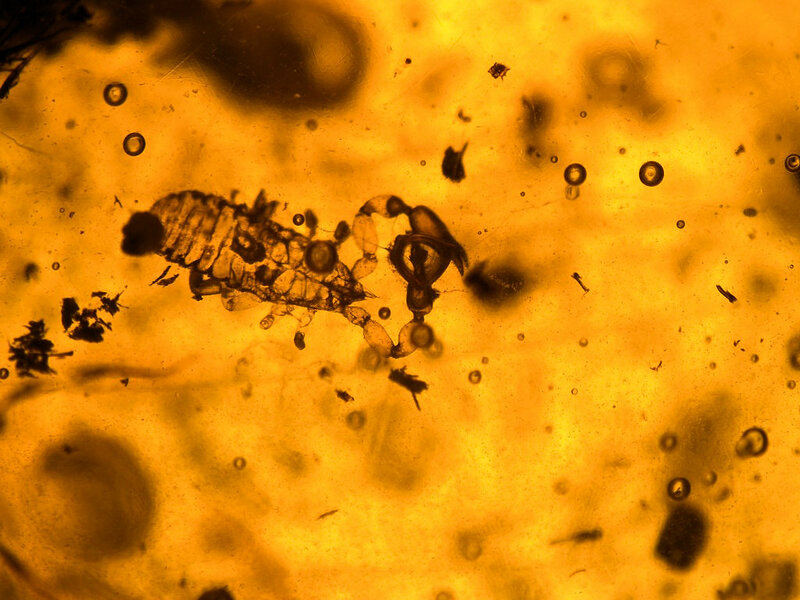 There are two female ants, and something else - in fact there is more. 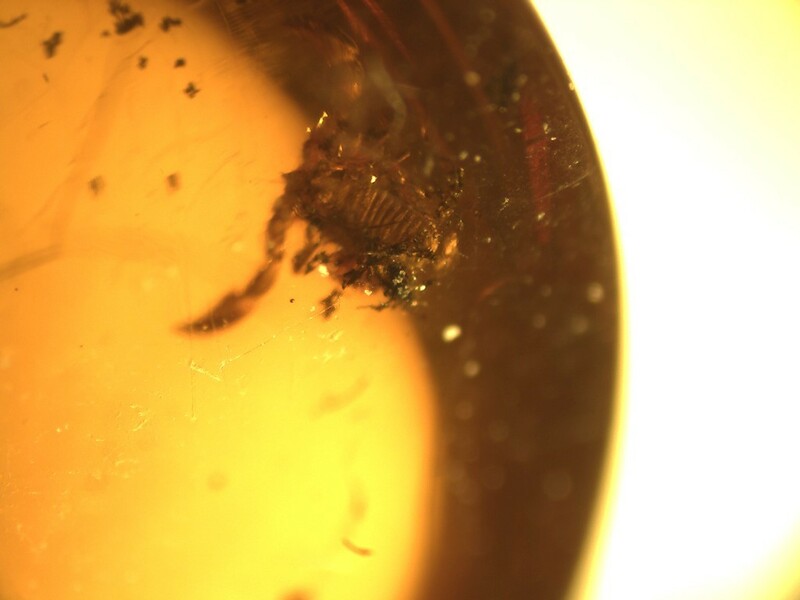 A very small piece of amber with a nice Pseudoscorpion located centrally among air bubbles and organic debris. Good price and a nice animal. 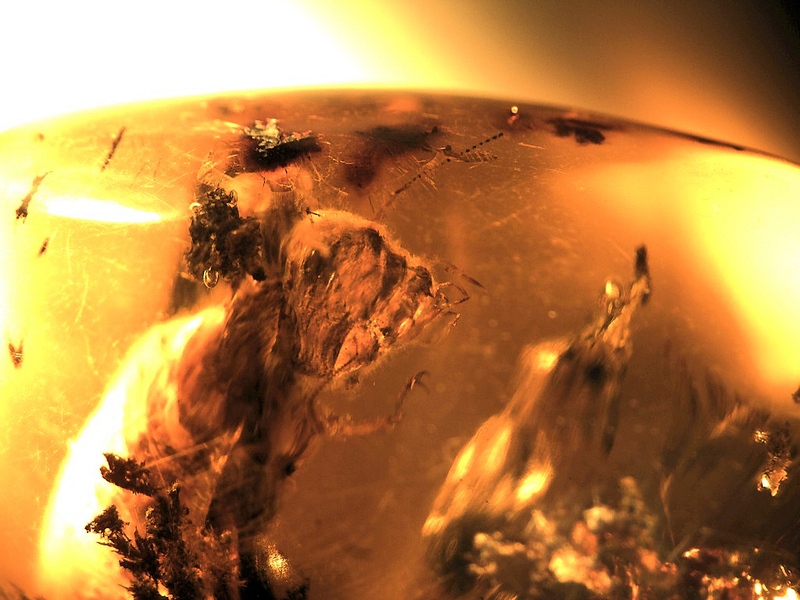 Looks like a stick going through the amber. 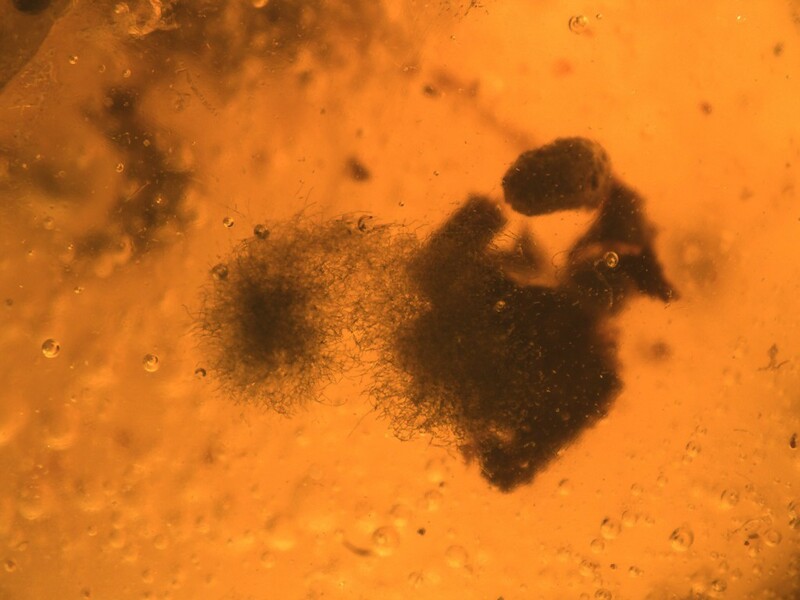 Also there is a spider, fungus gnat, Mycetophilidae, and a scattering of coprolites. Fun piece. There are structures that look like hair, but are too short (in my opinion) to be such. This is a good piece. 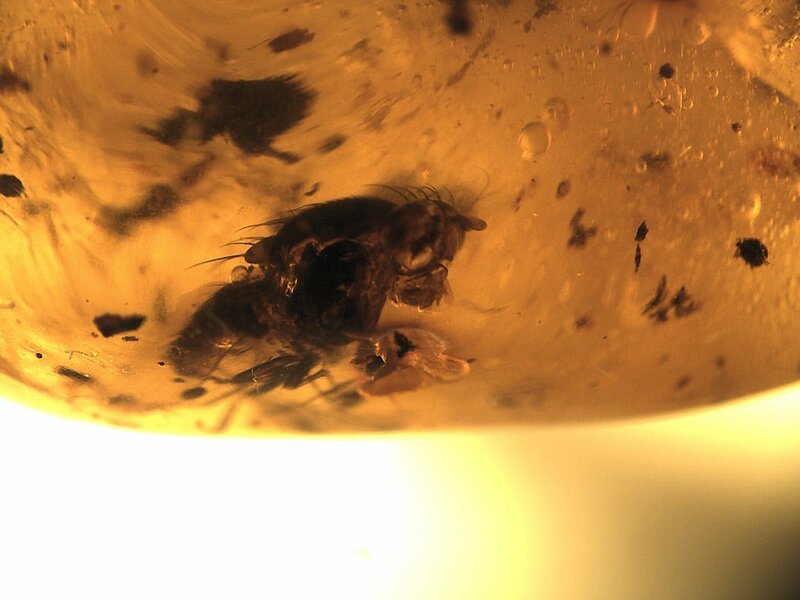 It has a very nice winged ant, Hymenoptera, Formicidae. The ants head appears to have some fungus growing out of it (very cool). 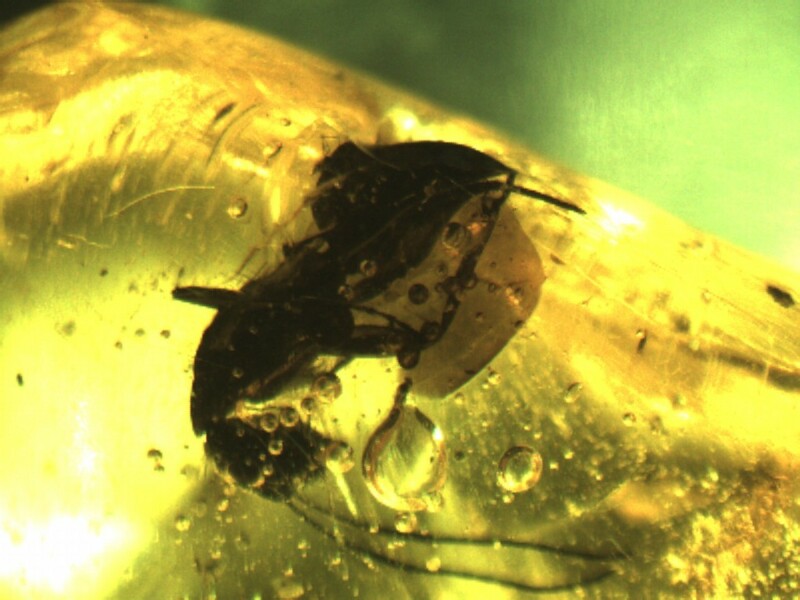 There is also a very small beetle near the ant (at least I think it is a beetle). Hard to know where to start on this gigantic 113.5 gram piece. It is just so big and has so much in it. There is what looks like 2 buds that have not opened yet, part of a messed up leaf, crane fly legs all over the place (no crane fly's though). There are (in no order here) lots of fungus gnats, midges, regular gnats, wasps, ants, flies, even a click beetle. There are so many animals inside (small ones) that I cannot even begin to count them. Every time I look at it, there are a half dozen new ones. 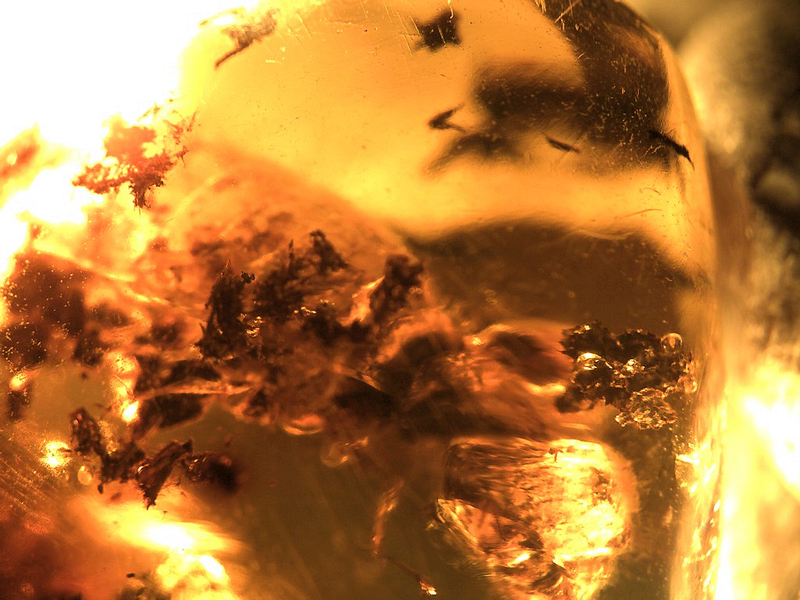 This is quite the piece about 3 inches x 3 inches x .5 inches - and almost a quarter of a pound of amber. This has a soldier caste termite, Isoptera. you can tell by the pointed snout. Rather uncommon, this is one of the guards of a termite mound. There is also the stamen of a flower in this piece. A rare animal. 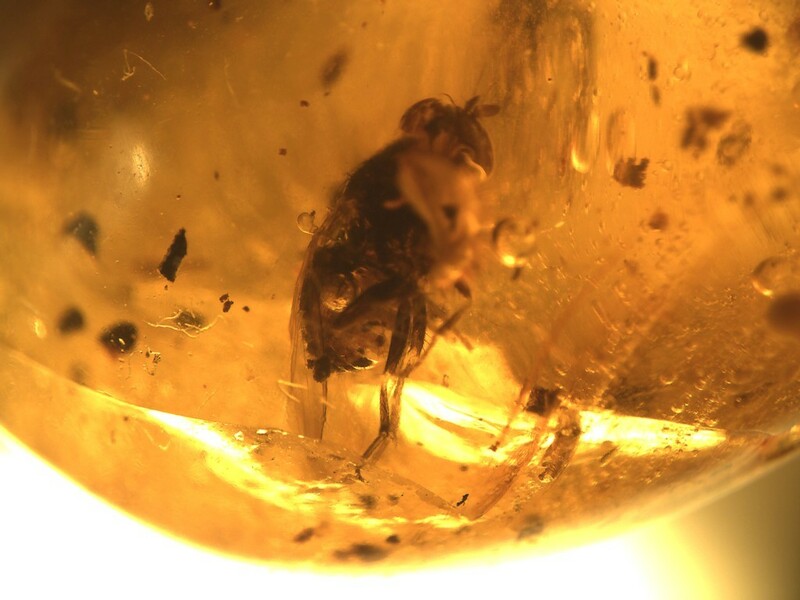 This amber contains an earwig, Dermaptera. These are rare in amber. 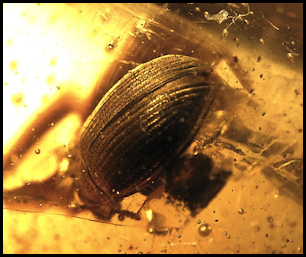 Also in this is a scuttle fly, Phoridae and what may be part of the caprice of a beetle. This is a rare one. 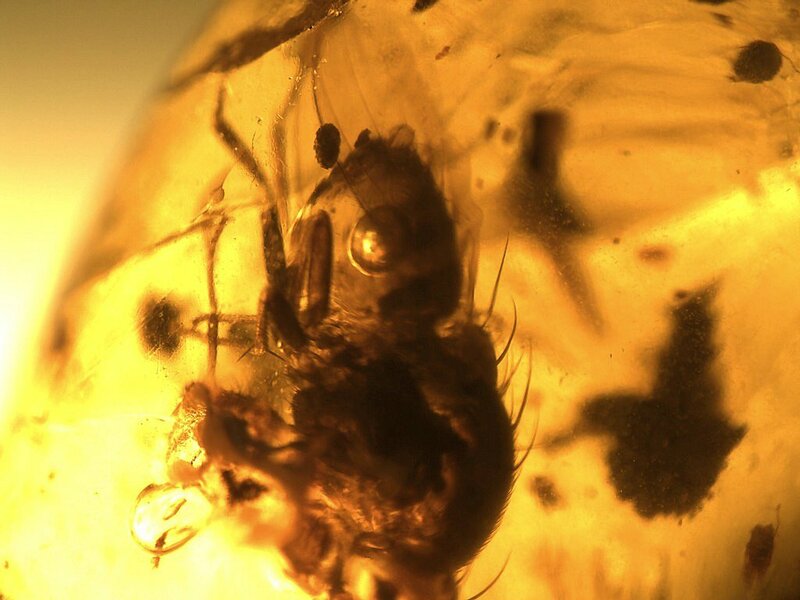 It comes from a parasitic larval form that only lives in spiders. Not only rare - but this is a perfect piece. 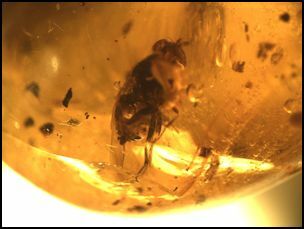 This Acroceridae Ogcodes fly is an internal parasite of spiders. Adults of living forms can be found in vegetated or forested areas with females usually in search of a spider host or feeding on the nectar of flowers. The life span of the adult is very short (usually only 1 week). 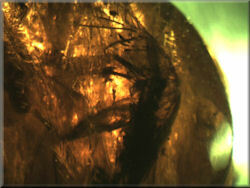 Larvae include a planidial first instar that actively searches out a host immediately after hatching from the egg. 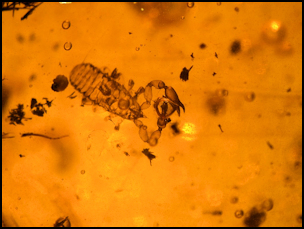 Larvae pass through 4 instars before emerging from the host and pupating. 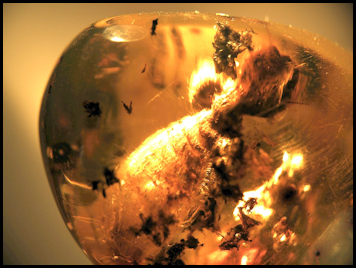 If you have not guessed, this is a very rare animal in Dominican amber. 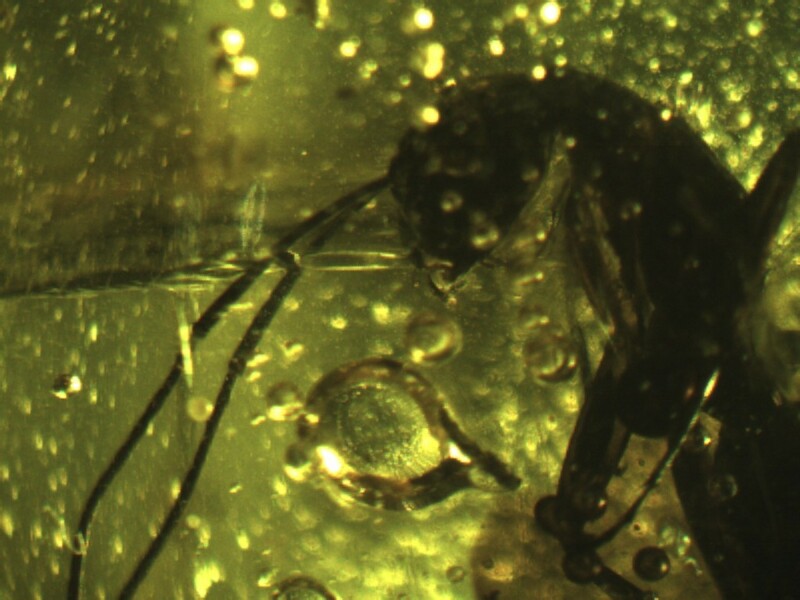 Three and a half female worker ants, Hymenoptera, Formicidae, are trapped. 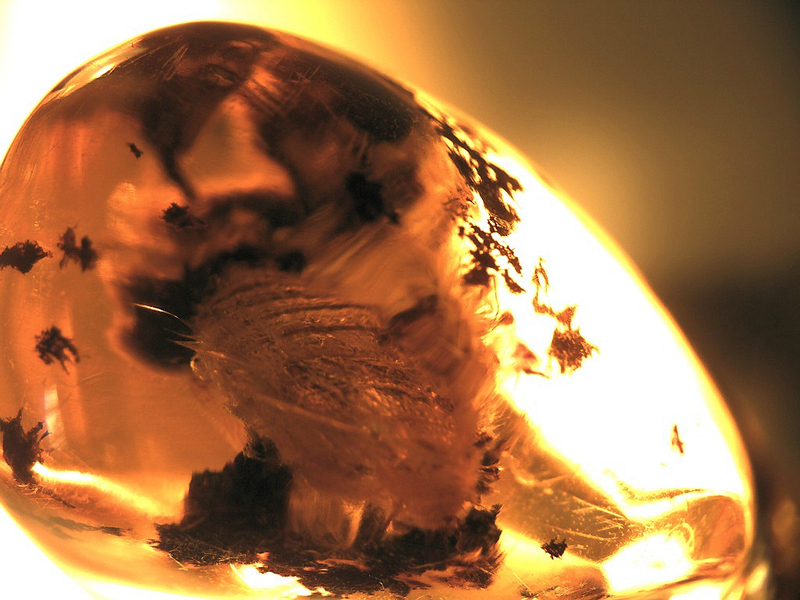 Beauties in their own right, this is a great piece of amber. 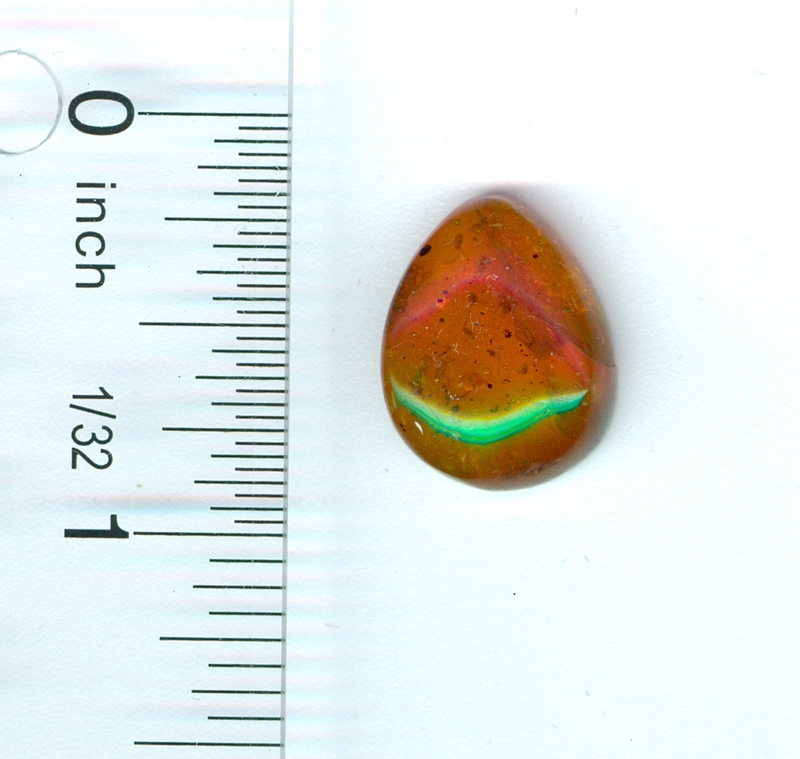 Good sized, clear and perfect for making into a pendant. 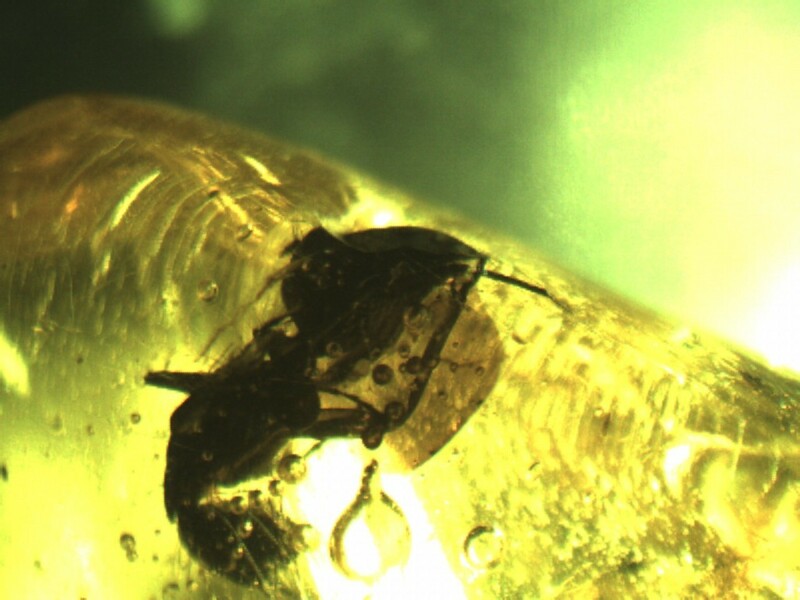 An unusual shaped piece of Dominican amber with a very nice female scuttle fly, Diptera, Phoridae. Not far away from the scuttle fly is a small twig from a liverwort. 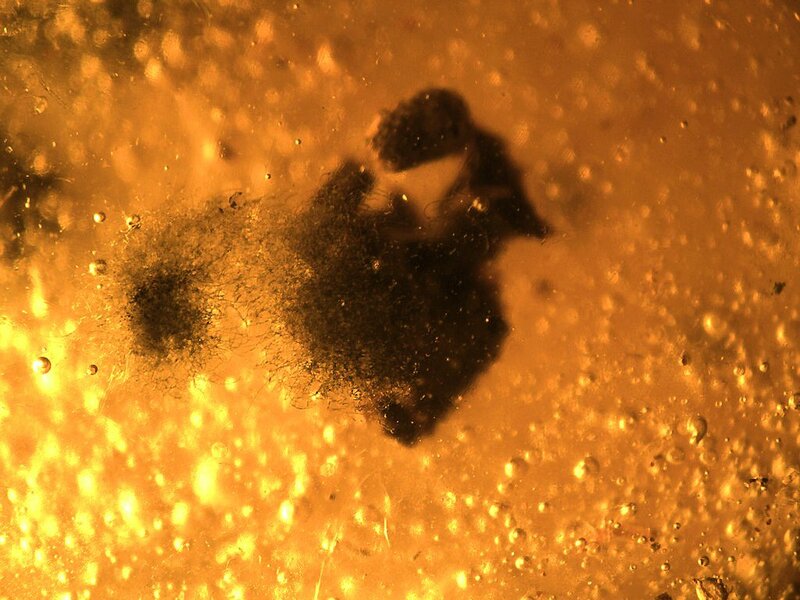 A leaf beetle, Coleoptera, Chrysomelidae, a couple of mites - maybe three, a spider and a fly a winged termite and even a thrip, Thysanoptera,- an entire bus load of animals. 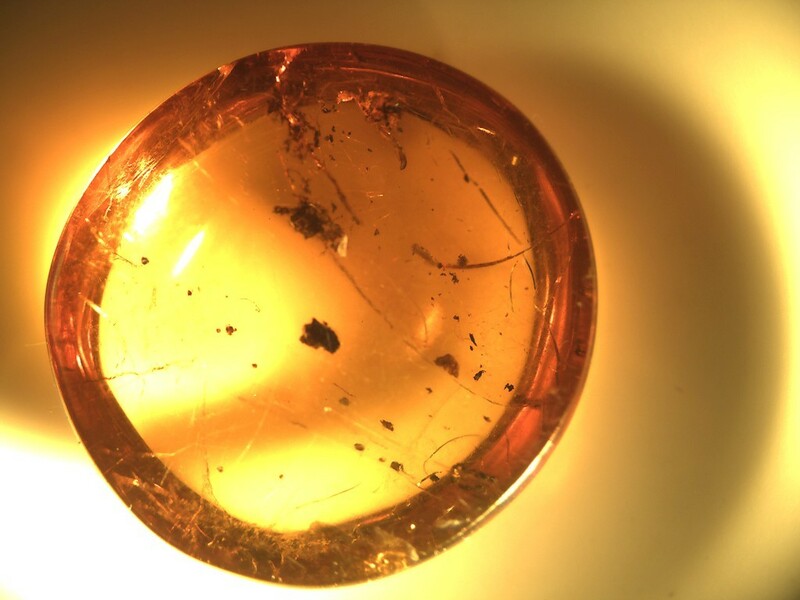 Good sized piece of amber. 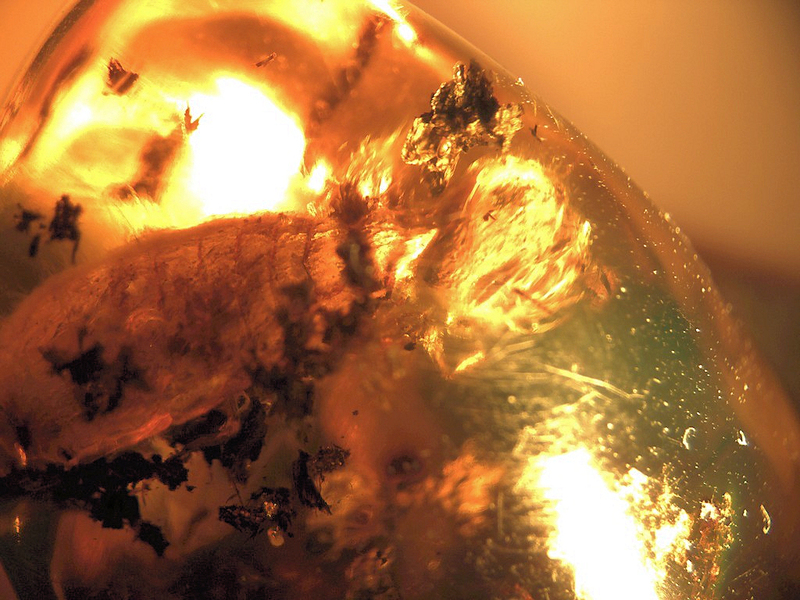 A large chunk of amber. This does have a very small plant part - a segment from a Bryophyte. But that is not it's call to fame - this has one of the nicest long legged flies that I have ever seen. 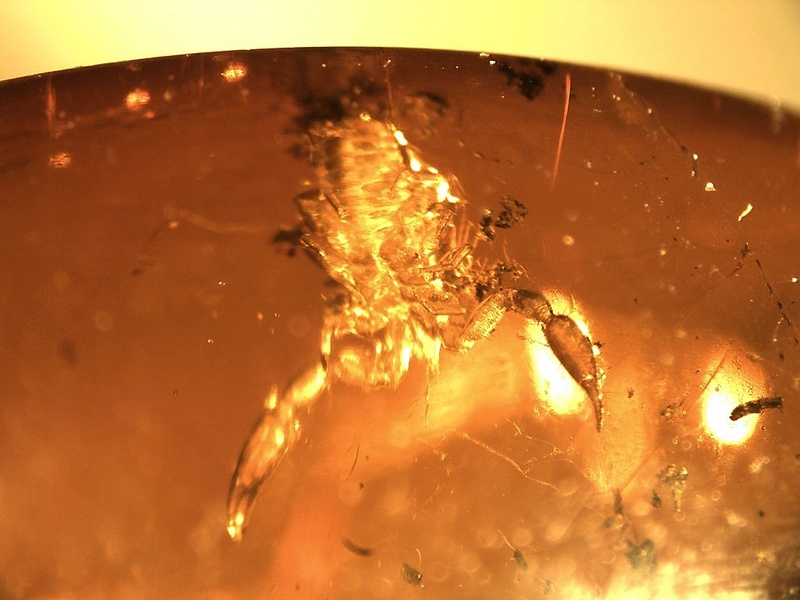 Just superb, you will love this piece of amber.